calibre has a conversion system that is designed to be very easy to use. Normally, you just add a book to calibre, click convert and calibre will try hard to generate output that is as close as possible to the input. However, calibre accepts a very large number of input formats, not all of which are as suitable as others for conversion to e-books. In the case of such input formats, or if you just want greater control over the conversion system, calibre has a lot of options to fine tune the conversion process. Note however that calibre’s conversion system is not a substitute for a full blown e-book editor. To edit e-books, I recommend first converting them to EPUB or AZW3 using calibre and then using the Edit book feature to get them into perfect shape. You can then use the edited e-book as input for conversion into other formats in calibre. This document will refer mainly to the conversion settings as found in the conversion dialog, pictured below. All these settings are also available via command line interface to conversion, documented at generated/en/ebook-convert. In calibre, you can obtain help on any individual setting by holding your mouse over it, a tooltip will appear describing the setting. The input format is first converted to XHTML by the appropriate Input plugin. This HTML is then transformed. In the last step, the processed XHTML is converted to the specified output format by the appropriate Output plugin. The results of the conversion can vary greatly, based on the input format. Some formats convert much better than others. A list of the best source formats for conversion is available here. The transforms that act on the XHTML output are where all the work happens. There are various transforms, for example, to insert book metadata as a page at the start of the book, to detect chapter headings and automatically create a Table of Contents, to proportionally adjust font sizes, et cetera. It is important to remember that all the transforms act on the XHTML output by the Input plugin, not on the input file itself. So, for example, if you ask calibre to convert an RTF file to EPUB, it will first be converted to XHTML internally, the various transforms will be applied to the XHTML and then the Output plugin will create the EPUB file, automatically generating all metadata, Table of Contents, et cetera. input This contains the HTML output by the Input plugin. Use this to debug the Input plugin. parsed The result of pre-processing and converting to XHTML the output from the Input plugin. Use to debug structure detection. structure Post structure detection, but before CSS flattening and font size conversion. Use to debug font size conversion and CSS transforms. processed Just before the e-book is passed to the Output plugin. Use to debug the Output plugin. If you want to edit the input document a little before having calibre convert it, the best thing to do is edit the files in the input sub-directory, then zip it up, and use the ZIP file as the input format for subsequent conversions. To do this use the Edit meta information dialog to add the ZIP file as a format for the book and then, in the top left corner of the conversion dialog, select ZIP as the input format. This document will deal mainly with the various transforms that operate on the intermediate XHTML and how to control them. At the end are some tips specific to each input/output format. This group of options controls various aspects of the look and feel of the converted e-book. One of the nicest features of the e-reading experience is the ability to easily adjust font sizes to suit individual needs and lighting conditions. calibre has sophisticated algorithms to ensure that all the books it outputs have a consistent font sizes, no matter what font sizes are specified in the input document. The base font size of a document is the most common font size in that document, i.e., the size of the bulk of text in that document. When you specify a Base font size, calibre automatically rescales all font sizes in the document proportionately, so that the most common font size becomes the specified base font size and other font sizes are rescaled appropriately. By choosing a larger base font size, you can make the fonts in the document larger and vice versa. When you set the base font size, for best results, you should also set the font size key. Normally, calibre will automatically choose a base font size appropriate to the output profile you have chosen (see Lehe seadistamine). However, you can override this here in case the default is not suitable for you. The Font size key option lets you control how non-base font sizes are rescaled. The font rescaling algorithm works using a font size key, which is simply a comma-separated list of font sizes. The font size key tells calibre how many „steps“ bigger or smaller a given font size should be compared to the base font size. The idea is that there should be a limited number of font sizes in a document. For example, one size for the body text, a couple of sizes for different levels of headings and a couple of sizes for super/sub scripts and footnotes. The font size key allows calibre to compartmentalize the font sizes in the input documents into separate „bins“ corresponding to the different logical font sizes. The largest headings will now become 18pt, while the footnotes will become 9pt. You can play with these settings to try and figure out what would be optimum for you by using the font rescaling wizard, which can be accessed by clicking the little button next to the Font size key setting. All the font size rescaling in the conversion can also be disabled here, if you would like to preserve the font sizes in the input document. A related setting is Line height. Line height controls the vertical height of lines. By default, (a line height of 0), no manipulation of line heights is performed. If you specify a non-default value, line heights will be set in all locations that don’t specify their own line heights. However, this is something of a blunt weapon and should be used sparingly. If you want to adjust the line heights for some section of the input, it’s better to use the Extra CSS. In this section you can also tell calibre to embed any referenced fonts into the book. This will allow the fonts to work on reader devices even if they are not available on the device. Text can be either justified or not. Justified text has extra spaces between words to give a smooth right margin. Some people prefer justified text, others do not. Normally, calibre will preserve the justification in the original document. If you want to override it you can use the Text justification option in this section. You can also tell calibre to Smarten punctuation which will replace plain quotes, dashes and ellipses with their typographically correct alternatives. Note that this algorithm is not perfect so it is worth reviewing the results. The reverse, namely, Unsmarted punctuation is also available. Finally, there is Input character encoding. Older documents sometimes don’t specify their character encoding. When converted, this can result in non-English characters or special characters like smart quotes being corrupted. calibre tries to auto-detect the character encoding of the source document, but it does not always succeed. You can force it to assume a particular character encoding by using this setting. cp1252 is a common encoding for documents produced using Windows software. You should also read How do I convert my file containing non-English characters, or smart quotes? for more on encoding issues. Normally, paragraphs in XHTML are rendered with a blank line between them and no leading text indent. calibre has a couple of options to control this. Remove spacing between paragraphs forcefully ensure that all paragraphs have no inter paragraph spacing. It also sets the text indent to 1.5em (can be changed) to mark the start of every paragraph. Insert blank line does the opposite, guaranteeing that there is exactly one blank line between each pair of paragraphs. Both these options are very comprehensive, removing spacing, or inserting it for all paragraphs (technically <p> and <div> tags). This is so that you can just set the option and be sure that it performs as advertised, irrespective of how messy the input file is. The one exception is when the input file uses hard line breaks to implement inter-paragraph spacing. Then, in your source document, mark the paragraphs that need spacing with class=“spacious“ . If your input document is not in HTML, use the Debug option, described in the Introduction to get HTML (use the input sub-directory). Another useful options is Linearize tables. Some badly designed documents use tables to control the layout of text on the page. When converted these documents often have text that runs off the page and other artifacts. This option will extract the content from the tables and present it in a linear fashion. Note that this option linearizes all tables, so only use it if you are sure the input document does not use tables for legitimate purposes, like presenting tabular information. Extra CSS is a very powerful option, but you do need an understanding of how CSS works to use it to its full potential. You can use the debug pipeline option described above to see what CSS is present in your input document. A simpler option is to use Filter style information. This allows you to remove all CSS properties of the specified types from the document. For example, you can use it to remove all colors or fonts. This is the most powerful styling related facility. You can use it to define rules that change styles based on various conditions. For example you can use it to change all green colors to blue, or remove all bold styling from the text or color all headings a certain color, etc. The Page setup options are for controlling screen layout, like margins and screen sizes. There are options to setup page margins, which will be used by the output plugin, if the selected output format supports page margins. In addition, you should choose an Input profile and an output profile. Both sets of profiles basically deal with how to interpret measurements in the input/output documents, screen sizes and default font rescaling keys. If you know that the file you are converting was intended to be used on a particular device/software platform, choose the corresponding input profile, otherwise just choose the default input profile. If you know the files you are producing are meant for a particular device type, choose the corresponding output profile. In particular, for MOBI output files, you should choose the Kindle, for LIT the Microsoft Reader and for EPUB the Sony Reader. In the case of EPUB, the Sony Reader profile will result in EPUB files that will work everywhere. However, it has some side effects, like inserting artificial section breaks to keep internal components below the size threshold, needed for SONY devices. In particular for the iPhone/Android phones, choose the SONY output profile. If you know your EPUB files will not be read on a SONY or similar device, use the default output profile. If you are producing MOBI files that are not intended for the Kindle, choose the Mobipocket books output profile. The output profile also controls the screen size. This will cause, for example, images to be auto-resized to be fit to the screen in some output formats. So choose a profile of a device that has a screen size similar to your device. Heuristic processing provides a variety of functions which can be used to try and detect and correct common problems in poorly formatted input documents. Use these functions if your input document suffers from poor formatting. Because these functions rely on common patterns, be aware that in some cases an option may lead to worse results, so use with care. As an example, several of these options will remove all non-breaking-space entities, or may include false positive matches relating to the function. Enabling this option will cause calibre to attempt to detect and correct hard line breaks that exist within a document using punctuation clues and line length. calibre will first attempt to detect whether hard line breaks exist, if they do not appear to exist calibre will not attempt to unwrap lines. The line-unwrap factor can be reduced if you want to ‚force‘ calibre to unwrap lines. This option controls the algorithm calibre uses to remove hard line breaks. For example, if the value of this option is 0.4, that means calibre will remove hard line breaks from the end of lines whose lengths are less than the length of 40% of all lines in the document. If your document only has a few line breaks which need correction, then this value should be reduced to somewhere between 0.1 and 0.2. If your document does not have chapter headings and titles formatted differently from the rest of the text, calibre can use this option to attempt detection them and surround them with heading tags. <h2> tags are used for chapter headings; <h3> tags are used for any titles that are detected. This function will not create a TOC, but in many cases it will cause calibre’s default chapter detection settings to correctly detect chapters and build a TOC. Adjust the XPath under Structure detection if a TOC is not automatically created. If there are no other headings used in the document then setting „//h:h2“ under Structure detection would be the easiest way to create a TOC for the document. Some publishers format chapter headings using multiple <h1> or <h2> tags sequentially. calibre’s default conversion settings will cause such titles to be split into two pieces. This option will re-number the heading tags to prevent splitting. This option will cause calibre to analyze blank lines included within the document. If every paragraph is interleaved with a blank line, then calibre will remove all those blank paragraphs. Sequences of multiple blank lines will be considered scene breaks and retained as a single paragraph. This option differs from the ‚Remove Paragraph Spacing‘ option under ‚Look and Feel‘ in that it actually modifies the HTML content, while the other option modifies the document styles. This option can also remove paragraphs which were inserted using calibre’s ‚Insert blank line‘ option. With this option calibre will attempt to detect common scene-break markers and ensure that they are center aligned. ‚Soft‘ scene break markers, i.e. scene breaks only defined by extra white space, are styled to ensure that they will not be displayed in conjunction with page breaks. If this option is configured then calibre will replace scene break markers it finds with the replacement text specified by the user. Please note that some ornamental characters may not be supported across all reading devices. In general you should avoid using HTML tags, calibre will discard any tags and use pre-defined markup. <hr /> tags, i.e. horizontal rules, and <img> tags are exceptions. Horizontal rules can optionally be specified with styles, if you choose to add your own style be sure to include the ‚width‘ setting, otherwise the style information will be discarded. Image tags can used, but calibre does not provide the ability to add the image during conversion, this must be done after the fact using the ‚Edit book‘ feature. calibre will analyze all hyphenated content in the document when this option is enabled. The document itself is used as a dictionary for analysis. This allows calibre to accurately remove hyphens for any words in the document in any language, along with made-up and obscure scientific words. The primary drawback is words appearing only a single time in the document will not be changed. Analysis happens in two passes, the first pass analyzes line endings. Lines are only unwrapped if the word exists with or without a hyphen in the document. The second pass analyzes all hyphenated words throughout the document, hyphens are removed if the word exists elsewhere in the document without a match. When enabled, calibre will look for common words and patterns that denote italics and italicize them. Examples are common text conventions such as ~word~ or phrases that should generally be italicized, e.g. latin phrases like ‚etc.‘ or ‚et cetera‘. Some documents use a convention of defining text indents using non-breaking space entities. When this option is enabled calibre will attempt to detect this sort of formatting and convert them to a 3% text indent using CSS. These options are useful primarily for conversion of PDF documents or OCR conversions, though they can also be used to fix many document specific problems. As an example, some conversions can leaves behind page headers and footers in the text. These options use regular expressions to try and detect headers, footers, or other arbitrary text and remove or replace them. Remember that they operate on the intermediate XHTML produced by the conversion pipeline. There is a wizard to help you customize the regular expressions for your document. Click the magic wand beside the expression box, and click the ‚Test‘ button after composing your search expression. Successful matches will be highlighted in Yellow. The search works by using a Python regular expression. All matched text is simply removed from the document or replaced using the replacement pattern. The replacement pattern is optional, if left blank then text matching the search pattern will be deleted from the document. You can learn more about regular expressions and their syntax at Kogu teave calibres regulaaravaldiste kasutamise kohta. Structure detection involves calibre trying its best to detect structural elements in the input document, when they are not properly specified. For example, chapters, page breaks, headers, footers, etc. As you can imagine, this process varies widely from book to book. Fortunately, calibre has very powerful options to control this. With power comes complexity, but if once you take the time to learn the complexity, you will find it well worth the effort. calibre has two sets of options for chapter detection and inserting page breaks. This can sometimes be slightly confusing, as by default, calibre will insert page breaks before detected chapters as well as the locations detected by the page breaks option. The reason for this is that there are often location where page breaks should be inserted that are not chapter boundaries. Also, detected chapters can be optionally inserted into the auto generated Table of Contents. calibre uses XPath, a powerful language to allow the user to specify chapter boundaries/page breaks. XPath can seem a little daunting to use at first, fortunately, there is a XPath tutorial in the User Manual. Remember that Structure detection operates on the intermediate XHTML produced by the conversion pipeline. Use the debug option described in the Sissejuhatus to figure out the appropriate settings for your book. There is also a button for a XPath wizard to help with the generation of simple XPath expressions. This expression is rather complex, because it tries to handle a number of common cases simultaneously. What it means is that calibre will assume chapters start at either <h1> or <h2> tags that have any of the words (chapter, book, section or part) in them or that have the class=“chapter“ attribute. A related option is Chapter mark, which allows you to control what calibre does when it detects a chapter. By default, it will insert a page break before the chapter. You can have it insert a ruled line instead of, or in addition to the page break. You can also have it do nothing. which means that calibre will insert page breaks before every <h1> and <h2> tag by default. The default expressions may change depending on the input format you are converting. Selles sektsioonis on veel valikuid. One of the great things about calibre is that it allows you to maintain very complete metadata about all of your books, for example, a rating, tags, comments, etc. This option will create a single page with all this metadata and insert it into the converted e-book, typically just after the cover. Think of it as a way to create your own customised book jacket. Sometimes, the source document you are converting includes the cover as part of the book, instead of as a separate cover. If you also specify a cover in calibre, then the converted book will have two covers. 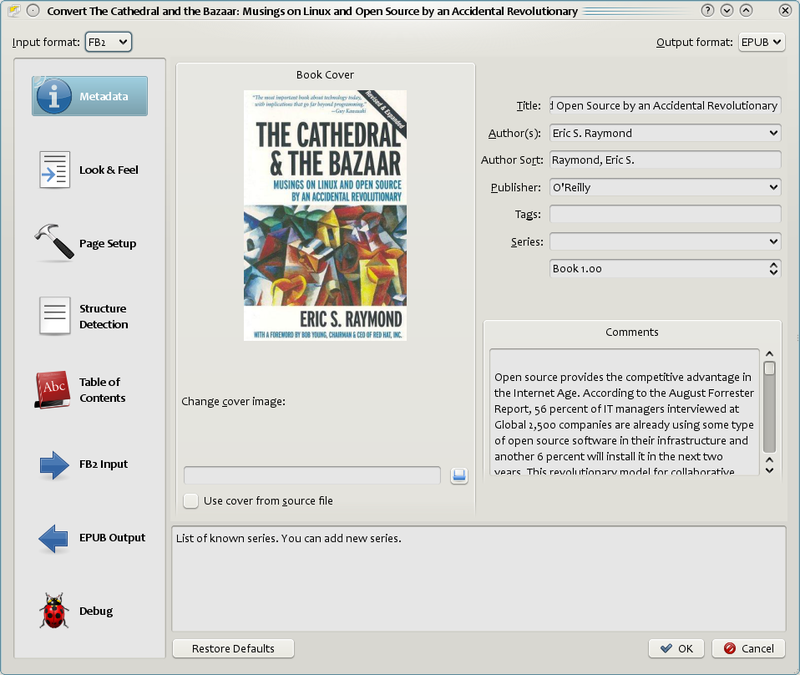 This option will simply remove the first image from the source document, thereby ensuring that the converted book has only one cover, the one specified in calibre. When the input document has a Table of Contents in its metadata, calibre will just use that. However, a number of older formats either do not support a metadata based Table of Contents, or individual documents do not have one. In these cases, the options in this section can help you automatically generate a Table of Contents in the converted e-book, based on the actual content in the input document. Using these options can be a little challenging to get exactly right. If you prefer creating/editing the Table of Contents by hand, convert to the EPUB or AZW3 formats and select the checkbox at the bottom of the Table of Contents section of the conversion dialog that says Manually fine-tune the Table of Contents after conversion. This will launch the ToC Editor tool after the conversion. It allows you to create entries in the Table of Contents by simply clicking the place in the book where you want the entry to point. You can also use the ToC Editor by itself, without doing a conversion. Go to Preferences → Interface → Toolbars and add the ToC Editor to the main toolbar. Then just select the book you want to edit and click the ToC Editor button. The first option is Force use of auto-generated Table of Contents. By checking this option you can have calibre override any Table of Contents found in the metadata of the input document with the auto generated one. The default way that the creation of the auto generated Table of Contents works is that, calibre will first try to add any detected chapters to the generated table of contents. You can learn how to customize the detection of chapters in the Struktuuri tuvastamine section above. If you do not want to include detected chapters in the generated table of contents, check the Do not add detected chapters option. If less than the Chapter threshold number of chapters were detected, calibre will then add any hyperlinks it finds in the input document to the Table of Contents. This often works well many input documents include a hyperlinked Table of Contents right at the start. The Number of links option can be used to control this behavior. If set to zero, no links are added. If set to a number greater than zero, at most that number of links is added. The Level 1,2,3 TOC options allow you to create a sophisticated multi-level Table of Contents. They are XPath expressions that match tags in the intermediate XHTML produced by the conversion pipeline. See the Sissejuhatus for how to get access to this XHTML. Also read the XPath tutorial, to learn how to construct XPath expressions. Next to each option is a button that launches a wizard to help with the creation of basic XPath expressions. The following simple example illustrates how to use these options. Not all output formats support a multi level Table of Contents. You should first try with EPUB output. If that works, then try your format of choice. Set the Level 1 TOC setting to //h:h2. Then, for chapter two, calibre will take the title from the value of the title attribute on the <h2> tag, since the tag has no text. Set the Level 1 TOC setting to //h:h2/@title. Then calibre will take the title from the value of the title attribute on the <h2> tags, instead of using the text inside the tag. Note the trailing /@title on the XPath expression, you can use this form to tell calibre to get the text from any attribute you like. There are two places where conversion options can be set in calibre. The first is in Preferences->Conversion. These settings are the defaults for the conversion options. Whenever you try to convert a new book, the settings set here will be used by default. You can also change settings in the conversion dialog for each book conversion. When you convert a book, calibre remembers the settings you used for that book, so that if you convert it again, the saved settings for the individual book will take precedence over the defaults set in Preferences. You can restore the individual settings to defaults by using the Restore defaults button in the individual book conversion dialog. You can remove the saved settings for a group of books by selecting all the books and then clicking the Edit metadata button to bring up the bulk metadata edit dialog, near the bottom of the dialog is an option to remove stored conversion settings. From the saved conversion settings for each book being converted (if any). This can be turned off by the option in the top left corner of the Bulk Conversion dialog. Note that the final settings for each book in a Bulk Conversion will be saved and re-used if the book is converted again. Since the highest priority in Bulk Conversion is given to the settings in the Bulk Conversion dialog, these will override any book specific settings. So you should only bulk convert books together that need similar settings. The exceptions are metadata and input format specific settings. Since the Bulk Conversion dialog does not have settings for these two categories, they will be taken from book specific settings (if any) or the defaults. You can see the actual settings used during any conversion by clicking the rotating icon in the lower right corner and then double clicking the individual conversion job. This will bring up a conversion log that will contain the actual settings used, near the top. Here you will find tips specific to the conversion of particular formats. 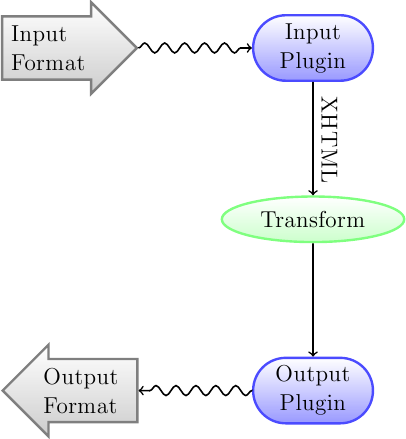 Options specific to particular format, whether input or output are available in the conversion dialog under their own section, for example TXT input or EPUB output . calibre suudab automaatselt teisendada programmiga Microsoft Word 2007 ja uuemaga loodud .docx-faile. Lihtsalt lisa fail calibresse ja klõpsa teisendamise nupul (veendu, et sa kasutad calibre uusimat versiooni, sest .docx-failide tugi on üpris uus). On olemas .docx näidisfail, mis demonstreerib calibre teisendamismootori võimekust. Lihtsalt laadi see fail alla ja teisenda see EPUB-iks või AZW3-ks, et näha, mida calibre teha suudab. calibre will automatically generate a Table of Contents based on headings if you mark your headings with the Heading 1, Heading 2, etc. styles in Microsoft Word. Open the output e-book in the calibre E-book viewer and click the Table of Contents button to view the generated Table of Contents. For older .doc files, you can save the document as HTML with Microsoft Word and then convert the resulting HTML file with calibre. When saving as HTML, be sure to use the „Save as Web Page, Filtered“ option as this will produce clean HTML that will convert well. Note that Word produces really messy HTML, converting it can take a long time, so be patient. If you have a newer version of Word available, you can directly save it as docx as well. Another alternative is to use the free OpenOffice. Open your .doc file in OpenOffice and save it in OpenOffice’s format .odt. calibre can directly convert .odt files. TXT documents have no well defined way to specify formatting like bold, italics, etc, or document structure like paragraphs, headings, sections and so on, but there are a variety of conventions commonly used. By default calibre attempts automatic detection of the correct formatting and markup based on those conventions. TXT input supports a number of options to differentiate how paragraphs are detected. Analyzes the text file and attempts to automatically determine how paragraphs are defined. This option will generally work fine, if you achieve undesirable results try one of the manual options. Assumes that the document has no formatting, but does use hard line breaks. Punctuation and median line length are used to attempt to re-create paragraphs. Attempts to detect the type of formatting markup being used. If no markup is used then heuristic formatting will be applied. Analyzes the document for common chapter headings, scene breaks, and italicized words and applies the appropriate HTML markup during conversion. calibre also supports running TXT input though a transformation preprocessor known as Markdown. Markdown allows for basic formatting to be added to TXT documents, such as bold, italics, section headings, tables, lists, a Table of Contents, etc. Marking chapter headings with a leading # and setting the chapter XPath detection expression to „//h:h1“ is the easiest way to have a proper table of contents generated from a TXT document. You can learn more about the Markdown syntax at daringfireball. Applies no special formatting to the text, the document is converted to HTML with no other changes. PDF documents are one of the worst formats to convert from. They are a fixed page size and text placement format. Meaning, it is very difficult to determine where one paragraph ends and another begins. calibre will try to unwrap paragraphs using a configurable, Line Un-Wrapping Factor. This is a scale used to determine the length at which a line should be unwrapped. Valid values are a decimal between 0 and 1. The default is 0.45, just under the median line length. Lower this value to include more text in the unwrapping. Increase to include less. You can adjust this value in the conversion settings under PDF Input. Also, they often have headers and footers as part of the document that will become included with the text. Use the Search and Replace panel to remove headers and footers to mitigate this issue. If the headers and footers are not removed from the text it can throw off the paragraph unwrapping. To learn how to use the header and footer removal options, read Kogu teave calibres regulaaravaldiste kasutamise kohta. Ei toetata keerukaid, mitmeveerulisi ega pildipõhiseid dokumente. Samuti ei ole toetatud vektorpiltide ja tabelite eraldamine dokumentidest. Some PDFs use special glyphs to represent ll or ff or fi, etc. Conversion of these may or may not work depending on just how they are represented internally in the PDF. Veel kord, PDF on väga-väga paha formaat, mida sisendina kasutada. Kui sa tõesti pead PDF-i kasutama, ole valmis väljundiks, mille kvaliteet võib olla kuskil vahemikus mõistlikust kasutamatuni, sõltuvalt sisend-PDF-ist. calibre will automatically convert this .cbc file into a e-book with a Table of Contents pointing to each entry in comics.txt. Various advanced formatting for EPUB files is demonstrated in this demo file. The file was created from hand coded HTML using calibre and is meant to be used as a template for your own EPUB creation efforts. Note that because this file explores the potential of EPUB, most of the advanced formatting is not going to work on readers less capable than calibre’s built-in EPUB viewer. calibre can directly convert ODT (OpenDocument Text) files. You should use styles to format your document and minimize the use of direct formatting. When inserting images into your document you need to anchor them to the paragraph, images anchored to a page will all end up in the front of the conversion. For a nested TOC with Sections marked with ‚Heading 2‘ and the Chapters marked with ‚Heading 3‘ you need to enter //h:h2|//h:h3. On the Convert - TOC page set the ‚Level 1 TOC‘ box to //h:h2 and the ‚Level 2 TOC‘ box to //h:h3. Well-known document properties (Title, Keywords, Description, Creator) are recognized and calibre will use the first image (not to small, and with good aspect-ratio) as the cover image. In addition to this, you can specify the picture to use as the cover by naming it opf.cover (right click, Picture->Options->Name) in the ODT. If no picture with this name is found, the ‚smart‘ method is used. As the cover detection might result in double covers in certain output formats, the process will remove the paragraph (only if the only content is the cover!) from the document. But this works only with the named picture! To disable cover detection you can set the custom property opf.nocover (‚Yes or No‘ type) to Yes in advanced mode. The first, most important, setting to decide on when converting to PDF is the page size. By default, calibre uses a page size of „U.S. Letter“. You can change this to another standard page size or a completely custom size in the PDF Output section of the conversion dialog. If you are generating a PDF to be used on a specific device, you can turn on the option to use the page size from the output profile instead. So if your output profile is set to Kindle, calibre will create a PDF with page size suitable for viewing on the small kindle screen. This will display the title at the left and the author at the right, in a font size smaller than the main text. _SECTION_ is replaced by whatever the name of the current section is. These names are taken from the metadata Table of Contents in the document (the PDF Outline). If the document has no table of contents then it will be replaced by empty text. If a single PDF page has multiple sections, the first section on the page will be used. Similarly, there is a variable named _TOP_LEVEL_SECTION_ that can be used to get the name of the current top-level section. When adding headers and footers make sure you set the page top and bottom margins to large enough values, under the Page setup section of the conversion dialog. You can also insert a printable Table of Contents at the end of the PDF that lists the page numbers for every section. This is very useful if you intend to print out the PDF to paper. If you wish to use the PDF on an electronic device, then the PDF Outline provides this functionality and is generated by default. You can customize the look of the generated Table of contents by using the Extra CSS conversion setting under the Look & feel part of the conversion dialog. The default css used is listed below, simply copy it and make whatever changes you like.